To provide DARE with a generic set of flight electronics, the electronics team is working on a new set of boards and accompanying software. The new design originates from the growing amount of different rockets within DARE, that all need electronics to operate. Until recently, the electronics were designed with rocket specific software. The downside is that a proper test and verification of the electronics and software cannot be done, other than during the actual launch. The new set of electronics has the same software in every stack, which can be tested extensively and in flight, only the state machine will be different for each rocket. A main board and power board form the basic configuration of any rocket. 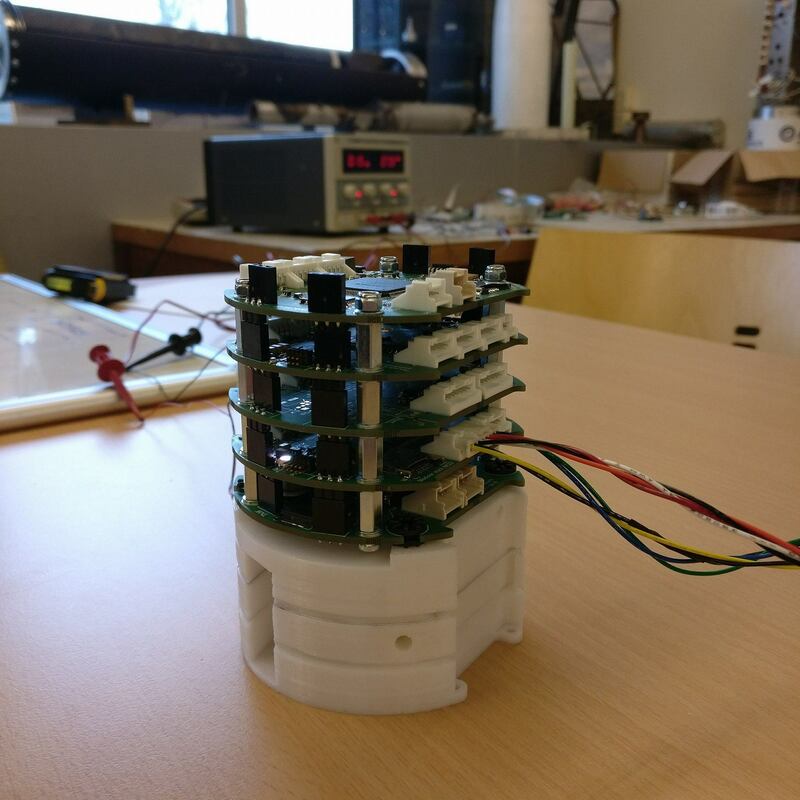 When sensors are wanted to record data, one or more sensor boards can be stacked on top, equipping the rocket with a wide range of sensor inputs. Another commonly needed option is the actuation board, which can actuate four actuators of choice per board. In liquid rockets, these actuators are often (solenoid) valves and in the case of Aether, the board is used to control four actively stabilised fins. At the top of the stack, a communications board can optionally be installed to have a live video link and real-time measurement transmitted from the rocket. The image below shows a render of a stack of modular flight electronics. The stack is mounted on rubber shock mounts to dampen the vibrations during flight. The two straight sides provide space for connectors (e.g. battery, sensor, actuators) and the cabling. Stacking connectors (black in the render) provide the power to all the boards and accommodate a communication link. One of the rockets that are going to use the modular electronics is Aether, which is going to have the full set, including the live video feed.